On our to-do list was a visit to the Hong Kong designer outlets. Located in Ap Lei Chau, a little island on the south side of Hong Kong Island, most of the outlets are in a tall, nondescript building that for all purposes looks like an office building from the outside. On each floor, though, are a handful of outlets for various name brands. While Tawn did his shopping, I discovered the Sift Patisserie on the 22nd floor. Quite coincidentally, after I started writing entries about this Hong Kong trip, Jack in Taiwan (now Toronto) suggested that I should go to Sift – a place I had already stumbled upon! 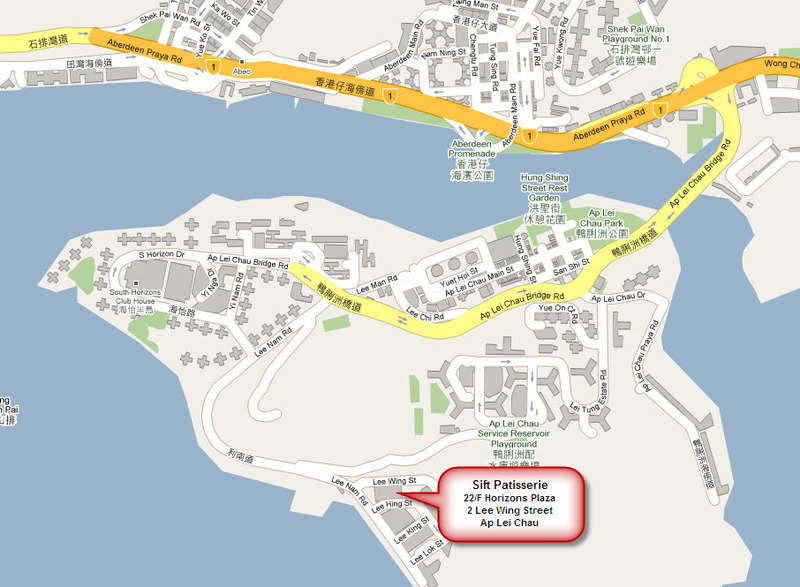 Location in the Horizon Plaza outlet building in Ap Lei Chau. 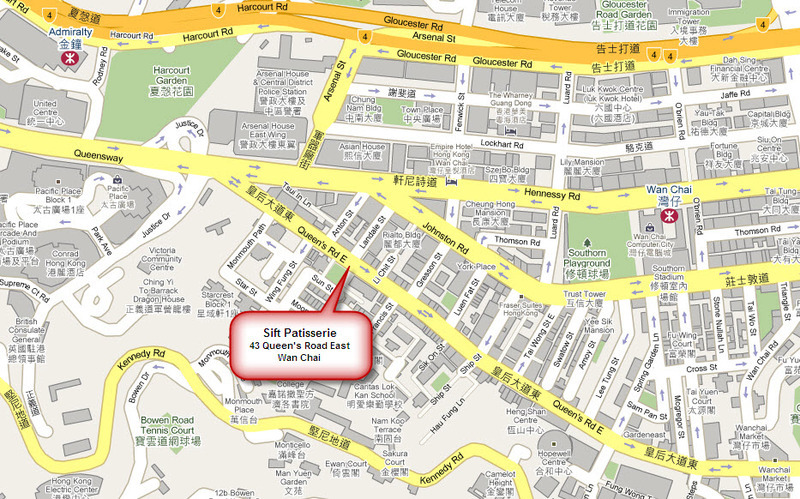 Location in Wan Chai on Queen’s Road East. 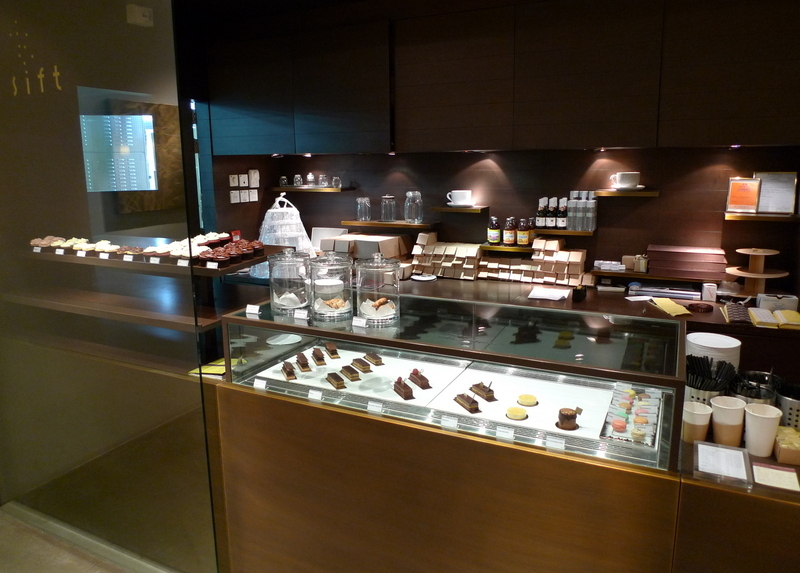 There is also a dessert bar in Soho on Graham Street with a more extensive menu and wine, too. We were there just about opening time and I walked in to find a very cute but very empty space. In fact, I waited for several minutes for someone to come out from the kitchen in back. While waiting, I sat on a sofa and read a magazine, eliciting a surprised gasp when an employee finally came out of the kitchen and found me there. Cupcakes are all in trend right now, aren’t they? It seems like they are, at least. Generally, I am not a huge fan of cupcakes or cake in general because they are usually kind of dry even if they look pretty on the outside. 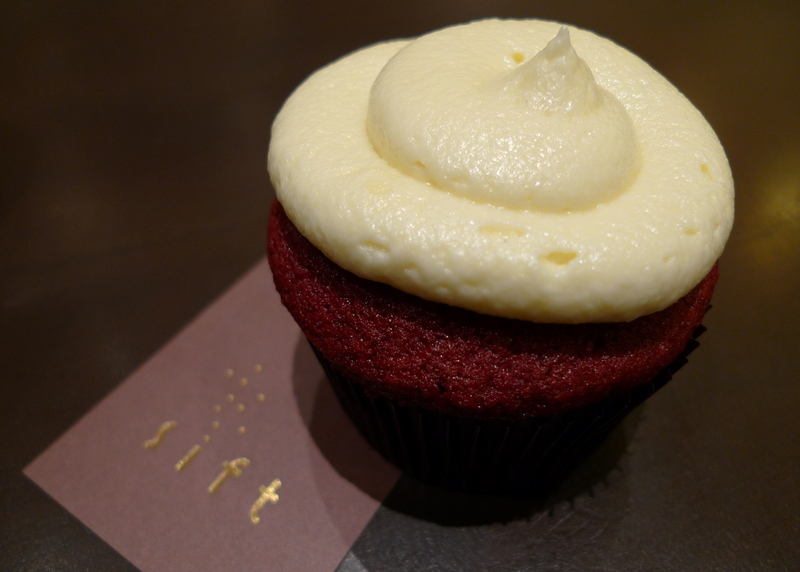 I was pleasantly surprised to try their red velvet cupcake which was very moist and tasty and had a really nice dollop of cream cheese frosting. While I’m always a little suspicious of red velvet – there is a LOT of red food coloring in there, after all, and I sense that artificial coloring probably isn’t that good for you – this was still a very enjoyable snack to accompany my latte. To that end, Joanne over at “Week of Menus” created a “Not Red Velvet Cupcake” recipe that I’ve been meaning to try. Entry here. Speaking of things artificial, I noticed that Sift’s tag line on their website is “everything sifted, everything refined”. While I get what meaning of “refined” they probably intended, my whole foods perspective made me cringe a bit at the word. Refined foods are the ones we’re meant to avoid, right? Anyhow, I’m sure they meant “fancy and luxurious” instead. I can tell that some thought went into their packaging design as the bags and boxes are very cute. The rest of the sitting space wasn’t so interesting – white sofa and ottoman covered in fabric (bad choice when people will eat cupcakes on them!) and the walls were pretty scuffed up. I get the impression that this location may be more of a production facility for them than an area focused on the retail side of operations. This entry was posted in Uncategorized and tagged Ap Lai Chau, Cupcakes, food, hong kong, patisserie, Sift by christao408. Bookmark the permalink. I have to agree about cupcakes – mostly dry even if they look good. I liked the look of the place but I imagine that was because of the lighting and lack of people. Filled it would probably be noisy and I’d go somewhere else to enjoy the snack. @murisopsis – Bingo! @CurryPuffy – While I wouldn’t go out of my way for it, it was nice since I was in the building already. When you mentioned ‘artificial’, I think of their cupcakes flavouring and colouring, as well as their decor. I also notice there are no potted plants in their store, seems very cold to me. How much are the cupcakes? I’ve the same thoughts as Val about the interiors. I really like cup cakes… I don’t understand what dryness you guys are referring to. Red velvet cake has always been a bit suspect to me. How much red food coloring does it take to make a cake that red? eeuu. I have a couple very moist and yummy cake recipes that lend themselves to cupcakes very well. Not dry at all. It can be done. @Dezinerdreams – Cup cakes in India are very moist and really really good aren’t they Vivek. Sometimes the cup cakes we get in stores here are not as moist and luscious.Chris I love cup cakes. I think I am going to go and make some right now. i don’t understand the cupcake craze either. i too am not a huge fan of cupcakes… they are often dry and unimpressive. we had some in our lab the other day, and my coworkers discovered a new way to eat them: cut them in half and invert the top so that the frosting is in the middle, like a sandwich. that way you get some frosting in every bite, and it’s much less messy to eat. hahaha yay engineers. @kunhuo42 – Oh, dear – you guys are funny. Let’s invent a new way to eat our cupcakes! @Made2Order – Hmm… “godly” seems a little overstated. @ZSA_MD – @Dezinerdreams – For whatever reason, a lot of cupcakes I’ve had both in Thailand and the US (and regular cakes, too) are pretty dry. Makes me prefer fruit desserts instead. @stebow – Tawn made a batch and I think he used two small bottles of food coloring. @TheCheshireGrins – Cupcakes seem to be fading. Macarons are kind of peaking. Mini bundt cakes are next, I think. 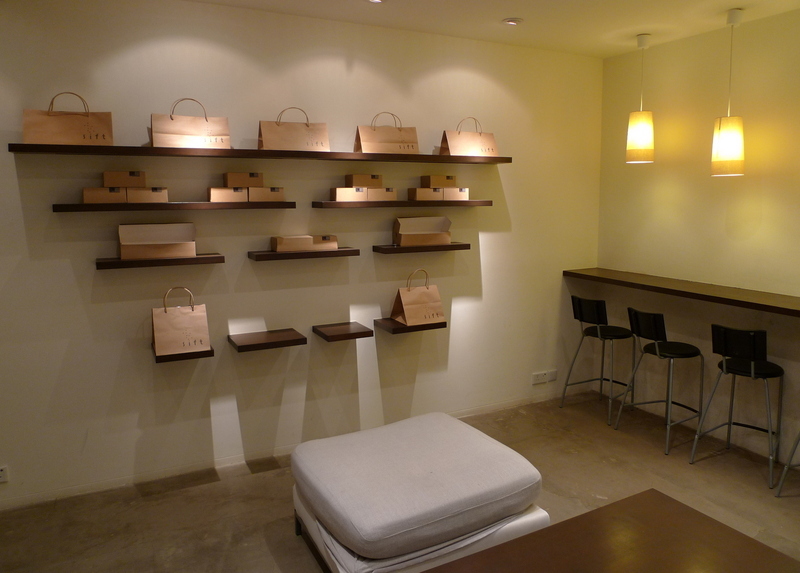 @ElusiveWords – That picture only shows about half the seating area. There were another two ottomans and a three-seat sofa around a coffee table / cube. The little bar area to the right wasn’t the main seating area. Plants would have been a nice addition, wouldn’t they? 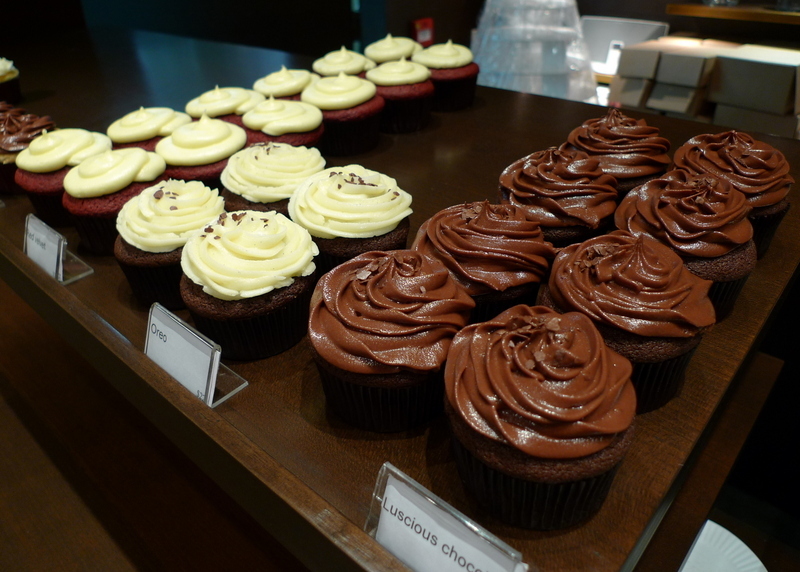 @vsan79 – They sure are attractive cupcakes! @kunhuo42 – oh that’s cool! i’m going to try that one day, when a cupcake falls upon my lap.chris, i don’t like cupcakes much either. it all tastes like a harder/drier sponge cake with a dollop of sugar on top. bleugh. @stepaside_loser – Exactly. @kunhuo42 – Could you take a picture or post a video of your team eating cupcakes like that? @christao408 – hahaha if someone brings cupcakes to lab again, maybe. Cream cheese is an evil creation in this society that does not exercise enough. @kunhuo42 – Will hold you to it Aaron…@Wangium – Yeah, it does kind of pack a punch.